Praise for the Seamless Enterprise "The Seamless Enterprise captures the rich insights in advanced tools and methods being used to achieve breakthrough performance by effective teamwork across functions." --Ray Stata, Chairman and CEO, Analog Devices "The Seamless Enterprise is by far the best resource we have found to date in helping us understand how to become a more efficient and effective "Horizontal Organization." Dan's unique insights and experiences with the Japanese approach to cross-functional management has been invaluable in our organization redesign efforts." --Keith Lawrence, Associate Director-Global Product Supply The Procter & Gamble Company Aspects of cross-functional management are already at work in most organizations. However, few companies are fully leveraging the true power of cross-functional teams to create dramatically improved, bottom-line results. The Seamless Enterprise is a step-by-step guide to creating teams that truly "cross functions" and are focused on improving results. Dimancescu shows managers how to build the groundwork for cross-functional management and describes a proven, six-step implementation plan. 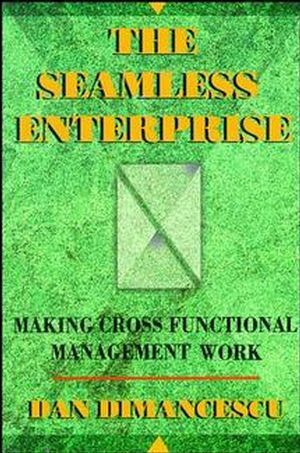 In addition, The Seamless Enterprise reveals important insights from early pioneers in the field of cross-functional management. These companies include Hewlett-Packard, AT&T, Ford and Boeing. Dan Dimancescu is President of Kogainon Films-Studio 901 Productions LLC, management consultant to high-tech companies, author of business books, and author of National Geographic Magazine expeditions.